Have you ever wished for an app that helped solve a work-related problem, or even envisioned exactly how one might look? Have you been frustrated with the out-of-date tech tool at your agency and wished for better and more practical solutions to everyday needs such as appointment scheduling, communicating with clients, or entering case records? Have you looked at a mental health app and wondered why the designers didn't consider evidence-based practices or why the buttons are configured on the top rather than along the side, or thought that the Terms of Service were not developmentally appropriate and user friendly? If so, a hackathon may be the perfect opportunity for you to contribute your real-world social work experience to technology-focused solutions. The origin of the word hackathon derives from a combination of the words hack and marathon. This should bring to mind the intensive experience one endures in a long-distance run (Briscoe & Mulligan, 2014) for good reason; hackathons are typically brief, intensive team-based events, lasting 48 hours straight, where participants work to solve a problem through the creation of a technological solution such as an app, electronic database, or website. Generally, hackathons seek to address a relevant problem, such as homelessness, safe driving, climate change, or school violence prevention. Teams form at the event and compete with each other for the best solution in the form of an app or tech tool. The hackathon's purpose is to brainstorm and create a range of good working models of possible technology solutions, with revisions and polishing occurring after the event. A team typically includes a small group of people who can contribute meaningfully to the type of solution needed, including programmers, but can also include professionals with expert or practice knowledge who have no technology experience. Participants work around the clock in a fun and relaxed environment, often taking sleep "breaks," eating fast food, and finding the inspiration that up-all-night collaborations engender. The hackathon process removes the bureaucracy and overplanning that often come with technology innovation in social work agencies and gets right to the heart of thinking about what's most needed and what's possible. Just like social workers have their own lingo, so do computer scientists, software developers, technologists, user experience experts, and data scientists. Technologists often use a framework called design thinking, a solution-focused approach to problem-solving that comprises structured phases: inspiration (understanding the problem, need, and potential product users), ideation (multidisciplinary brainstorming and idea generation), and implementation (prototyping, troubleshooting, and refining). A hackathon focuses on an abbreviated rapid iteration of the first two phases of the design thinking model in which team members share their understanding of the problem and then prototype a solution. App creators and technologists apply their tech-based skills to drive innovation and create new web-based and mobile applications, also known as apps. Many apps are created to address behavioral and social problems; for instance, thousands of apps are available to address individual issues related to mental health, eating disorders, case management, and community referrals. You can even find agency-level tools such as program attendance tracking, budget development apps, and app-based parenting classes, as well as apps for encouraging civic engagement that report on candidates' political activities and legislative track records. Tech solutions, which are ubiquitous in the agency environment, are used to manage client data, billing, and communication. App designers focus on a format that is enticing and easy to use, but too often they lack a true understanding of their end users and the context of the problems they seek to solve. When this occurs, the app can fail to meet user needs. That's where social workers come in. 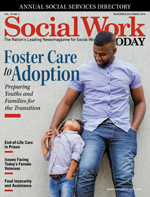 Social workers bring to their systems understanding, empathy, advocacy, and value for social justice, making them uniquely positioned to provide context and relevance so that apps offer helpful and appropriate solutions. Social workers can play important translational roles to help developers understand client populations and community contexts. When social workers create a seat at the table at cross-disciplinary meetings like hackathons, they can address how to protect vulnerable populations (and their data), help technologists consider ways of making their products more accessible, and encourage the team to think about the risks and benefits of their products. Social work participation in the development and design of technological solutions, from wearable devices to software and hardware, will improve the ways designers harness technology for the good of the people they serve. Beyond the basic utility of the new technologies developed during hackathons, the process of participating in a hackathon offers social workers opportunities for a variety of new learning experiences, including working with unfamiliar collaborators, learning first-hand how the grass-roots tech innovation process works, gaining programming skills, and adding a different perspective to the ways in which hackathon teams think about and understand the use of their tools in real contexts. Imagine you are a social worker who has found your way to a hackathon. It's focused on a topic you're really interested in—let's say child abuse. The first thing you might notice is a lack of diversity in the room. The tech industry is overwhelmingly white and male. The second observation that might strike you is the sprawling space. Hackathons are driven by team-style innovations that require small clusters or rooms for groups to spread out and get to work, connecting and collaborating. Some settings have audience style seating for the introductory and closing sessions, but the majority of the experience is spent working in small teams on your specific project. Another notable characteristic is the level of competition. Some teams and individuals may be more open-minded about sharing ideas, building together, and brainstorming, whereas other groups may feel private and standoffish. Cash prizes fuel a competitive spirit, but in hackathons for social good, working on solutions to real-world problems is often its own reward. Hackathon standard operating procedure often includes coffee, water, and fast food. Remember, this is similar to a marathon, in that you're in it for the long haul and it is important to replenish your mind, body, and spirit throughout the adventure. Once you have joined a team, you'll have the opportunity to apply your social work skills. You can help with introductions, make connections, and declare your social work greatness. Techies tend to welcome social workers because they realize their importance and don't necessarily want to do our jobs. That said, everyone in a group brings different strengths and skill sets, and your voice will improve outcomes. While others are getting quite technical, social workers have hands-on practical experience. For example, social workers know that building an app for homeless people is risky because it can't be assumed that population has a smartphone, Wi-Fi, or access to reliable power sources. This situation is the perfect opportunity to offer input by presenting case studies and creating a mental narrative in the minds of the coders, helping place them in the shoes of the person they're trying to help so that the team can continue through the ideation process and seek alternative methods to address homelessness issues through code. Social workers can emerge as hackathon team leaders through their ability to organize ideas, express empathy, and manage team dynamics to support idea sharing. Embrace your leadership and priority-setting skills, and demonstrate your expertise in real-life practice and ethics. This is where social workers can truly shine. When your group starts to get tense, recommend a break, stretch, or snack. It is your job as a social worker to lead with empathy, acknowledge differences, and move the team forward. Hackathons occur around the world, with the list growing exponentially. You can use Google to find those where you can incorporate your social work skills and professional experience. Then, sign up and asked to be included in future events. You can also register on various sites that provide hackathon and related technology resources. Meetup.com is a great resource for finding hackathons in your area, as is contacting your local public officials or open data organization. — Ruby Guillen, MSW, is a hacktivist who is passionate about advancing empowerment through technology. — Melanie Sage, PhD, LICSW, is social work faculty at University at Buffalo, State University of New York, and researches the intersection of technology and child welfare. — Lauri Goldkind, PhD, is social work faculty at Fordham University and editor of the Journal of Technology in Human Services. — Neva Wallach, MSW, seeks to advance social change and innovation through technology. Briscoe, G., & Mulligan, C. (2014). Digital innovation: The hackathon phenomenon. Creativeworks London Working Paper, 6, 1-13.